Gearbox Software is becoming a rare breed. It's among a handful of independent AAA studios in the business (Avalanche, Ready at Dawn, and Insomniac to name a few others) that has been able to carefully manage its growth and work on new IP without feeling like it's risking the studio's future. The Borderlands franchise in particular really propelled the studio to new heights. It's shipped over 26 million copies worldwide, spawned a separate episodic series from Telltale Games and led to a Hollywood movie deal with Lionsgate and Avi and Ari Arad. It's been seven years since Gearbox created the IP and now it's preparing to unleash its next new IP, Battleborn, this May. Creating new IP in any entertainment medium is always a risk, but in the AAA game space where anywhere from $40 million to $100 million can be sunk into a project over many years of grueling development, it's particularly frightening to bet that an often fickle consumer audience will plunk down $60 for your new game. "It's terrifying. But the reality is we're entertainers, so even if the worst result imaginable happens, no one has to get hurt," Gearbox boss Randy Pitchford tells me. If a studio starts crumbling and people lose jobs, then they can get hurt, but the reality is that yes, games are entertainment - lives generally aren't being put on the line. Pitchford went on to allude to astronaut Scott Kelly's recent trip home to Earth. "We talk about these are big risks and they're not really. There's a guy right now who's in the space station and he's been there for a year and is coming home next week and it's like, a year in space, the first guy ever. The people on his team, they're taking risks. He's taking risks. That's real risk. Something goes wrong and we lose a dude and the whole space program is set back a long time. But when we make mistakes, people just aren't entertained as much," he says. "You won't see a Gearbox or anyone like us announcing a big commercial VR product until it's clear what the commercial case is. Up until this point, it's all demos, right?" Pitchford isn't trying to make light of the grueling march a studio can endure as it gears up for a new IP launch. Gearbox has been especially careful with its launches. "AAA video game IP in this industry is a rare thing. New IP is not created every day... Gearbox has been fortunate. This is our third IP we've created and that signifies a lot of trust and a lot of responsibility," Pitchford continues. "And we've been able to do some pretty inventive things. Battleborn has a lot of new stuff in it, a lot of stuff people haven't done before or seen before in a video game. So it's pretty exciting to test it. It's terrifying though because we have no idea how it's going to be received. Well, we have a little idea, but not a great idea. But we're having a lot of fun and the people who are playing the game with us are having a lot of fun and it feels like we're onto something so I hope people discover the game and enjoy it." Gearbox knows how important it is to make a good first impression when it comes to a new IP, which is why the studio ultimately delayed Battleborn from February to May. The online component just wasn't ready and there have been far too many examples of broken online gameplay at launch in recent years. "It's all about polish...and we wanted to make sure that when we launched the game that it was a solid and robust online experience whether you play a solo game or a cooperative game in the campaign or you're playing PvP. The game is pretty well connected and we wanted to make sure that all of that is perfectly fine for everyone. Nothing's perfect, of course, but we did a closed technical test and we had hundreds of thousands of people who signed up and that taught us a lot about what just really stressed the system and showed us what we really need to do to be ready for the prime time," Pitchford says. "The game could be out now but...we had people who were waiting and queueing... That closed technical test we gave is invaluable to that process," Pitchford adds, noting that Battleborn's beta will be the final stress test. Talking about risk, we eventually get to the continually discussed topic of virtual reality. For a studio like Gearbox, launching a new AAA IP actually feels safe compared to VR, Pitchford remarks. "You know, we were talking earlier about the risk involved in something like Battleborn. There's a lot of risk, there's a lot of money that's gone into it, but there's a certain degree of confidence that even in the worst case scenarios, there's a customer and we can make some predictions about the customer and we probably can avoid the worst case scenarios and do better than that, in which case you can get more and more confident that you can take that risk. With VR, those models don't exist yet so everyone has to temper their risk a little bit more or be really comfortable just not necessarily doing it to build a business case but doing it to test and see if there's a platform here," he explains. Pitchford acknowledges that Gearbox has its "fingers in a lot of it" when it comes to VR and AR (which Pitchford, like Mike Capps sees as an even bigger opportunity), but it's all just experimental. "I think we're waiting to find out what the traditional business for VR is. I'm always excited about new platforms and obviously we've been messing around with the platform... You won't see a Gearbox or anyone like us announcing a big commercial VR product until it's clear what the commercial case is. Up until this point, it's all demos, right?" he says. "Everything we've grown to build we've built under our own weight so we haven't built it on debt or anything like that. We've earned every bit of growth and we've grown very carefully and very slowly and very methodically..."
While it may be a while before the Gearbox studios of the world hop on the VR bandwagon, numerous smaller devs (like Owlchemy) are more than happy to commit fully to the space, even if the market is entirely unknown territory. "A lot of the guys doing that have the least to lose so it's actually easier to [take a] risk. It's easier for them to make that decision because - I remember what it was like when we were just starting out and if I could know immediately that we could be in a smaller pond, when you know that you're definitely going to be a small fish, then it's helpful," Pitchford reflects. "That's one of the neat things about the appearance of a new platform is that the pond is, by definition, smaller, so if you're a smaller fish you might have a chance to appear to be a bigger fish than you actually are in a smaller pond." So does Pitchford have any regrets about letting Gearbox get as large as it has? Not at all. The company recently opened a Quebec studio to support its full slate of games, and a PR representative indicates that Gearbox is "hiring aggressively" at the moment. "There's a lot of talent up in Quebec and really it all comes down to people. So there's some folks who we developed a relationship with up there who have the right stuff and are ready to do something and we have the right brand and the right resources and the right need and they have all the same interests that we have so it just made a lot of sense. It's more of a story about people than a story about business, frankly, so it's difficult to break it down from a business point of view. But I think that it makes a lot of sense. We have more brands than you see us actively building games in right now, so the fact that that story about people has worked out and has allowed more capability to happen for the studio has been really good and I think you'll see the results from that down the road," Pitchford notes. Gearbox has a workforce that's been hovering between 300-400 employees, but Pitchford believes that management now has a grip on how and when to expand. "So far the growth we've had seems to be helping us get stronger. We could not do a game like Battleborn without the people we've got. We couldn't have done Borderlands unless we grew to it. One of the things, we've created some brands that people really want more stuff from. We get email all day, 'give me another Brothers in Arms game' or 'what's going to happen to Duke Nukem?' And so that requires some attention to do those things and we like creating new things like Battleborn and so it just feels very natural. But I'll tell you, with more capability comes more capability," he says. "Everything we've grown to build we've built under our own weight so we haven't built it on debt or anything like that. We've earned every bit of growth and we've grown very carefully and very slowly and very methodically over the years so it hasn't been like a burst thing. The biggest burst we ever had I think was 2006/2007 and it was a little too fast and so we learned what that was like and we had to deal with that. We had folks that didn't exactly do right for us as the way we wanted to be so that was a tough thing to deal with but that taught us a lot, so I think we found a pretty good place." For Gearbox, the business can expand without necessarily growing to an unmanageable scale. One way of doing that is by partnering up with other external talent. The Telltale partnership for Borderlands was a perfect example of growing the appeal of that IP. "That proved that the franchise is strong with its characters and its storytelling... I was stoked that they wanted to get involved because those guys are great storytellers and they know what they're doing so that was a really easy decision for me. And as we talked about possibilities and as we developed the outline and as they came with certain pitches on the scenarios and stuff, some of the stuff they wanted to do was pretty radical and really changed the universe and I was happy to be on board with that stuff," Pitchford comments. 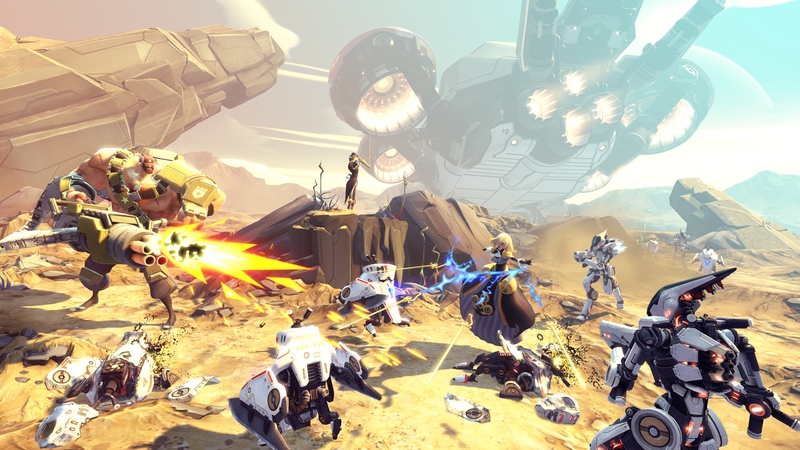 Given the success Tales from the Borderlands has seen, we wouldn't be surprised to see Gearbox apply a similar formula to its new IP Battleborn, but Pitchford just wants to ensure a successful launch for that franchise first. "I worry that we've reached a ceiling with how many folks that we can reach in the video games [space]"
"I think, again, it's about people. There have been lots of folks that have come at us seeing if they could make some money off the Borderlands franchise and you'll notice that there's not a lot of stuff out there, but with the Telltale guys it was really easy. I think we'll manage all of our brands with the same sort of love and self-respect where if there are some good folks that really want to do something cool and awesome that are capable and worthy then you're going to find us excited to partner up. But we are going to be protective of the brand against folks that might just want to use it and discard it and don't have our customer's best interests in mind," he adds. So what's the next frontier for Gearbox, or indeed the game industry as a whole? Improving brand engagement and broadening the audience was a key discussion that Pitchford led at DICE during a roundtable. "I've got these brands - Borderlands for example - but I worry that we've reached a ceiling with how many folks that we can reach in the video games [space]. I think there's a lot more people out there that would be excited about such a premise if they only knew it existed. And so the question is how do we reach people outside of the folks who we're already talking to in the video game space?" wonders Pitchford. "It's no secret we did a deal with Lionsgate and Arad Productions to have a Borderlands film made. That's really an interesting angle. We'll see what happens there. I'll tell you, I trust those guys a lot. Ari and Avi Arad are great. And Ari really wants to be the guy to figure out how to make good video game movies... There are a a lot of guys in video games who feel it's a big risk to see a film made because so far there haven't been great examples of great video game films," he continues. "And fortunately, the Arads figured it out when Avi was doing Marvel and did Spider-Man and Iron Man and X-Men; he figured out how to make comic book movies that are really fun and do right by the franchises that are really engaging and entertaining for large audiences. That gives me a lot of hope that working with them we can figure out a good film." Naturally, turning video game IP into film isn't the sole solution to finding larger audiences, but it's certainly helped awareness with properties like Tomb Raider and Resident Evil. "The film is just one angle. So my questions at the roundtable were about what other ways can we figure out how to reach people with our video game brands? How do we reach people outside the same group of video game customers that we're always talking to over and over again? And it's a tough problem," Pitchford says. "If we want to reach people around the world or reach people that we've never shown the stuff to before, we've got to face it." You make your artform relevant. That's done through the project-based business model, as it has throughout the entirety of the Western art tradition. Otherwise, you're just churning out rehashed stuff.